Do you want to become a better naturalist? Here is a butterfly multiple choice quiz question that will require a butterfly book or looking on the web for the species below. Do a little research and vote on what kind of butterfly you think this is. The answer will be posted soon. If you have any questions, be sure to leave a comment on this post. At this time of year, insects are abundant and easy to find and photograph. Last week I tried recording insects on video at Ashland Nature Center and the Bucktoe Creek Preserve. Most of the videos have the constant buzzing of Silver-bellied Cicada in the background, which is the sound of late summer here in Delaware. 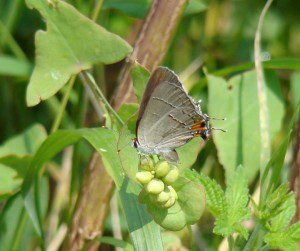 Insects are feeding on native plants, and in turn feed birds heading south. Since Black Walnuts are full of insects, these are my favorite trees to watch for migratory songbirds. The flow of energy from the sun to walnut tree to caterpillar to warbler is easy to see these days. Get outside to witness these natural connections yourself as migratory songbirds stop in our area between now and late October. The odd and somewhat creepy Butternut Woollyworm was found on a Black Walnut, which is one of their favorite foodplants. This insect looks like a caterpillar, but is actually the larva of a sawfly, Eriocampa juglandis. Sawflies are related to wasps, but their larva look like moth or butterfly caterpillars. As you watch the Common Whitetail dragonfly, look at the abdomen flexing in and out, which is how insects breathe. The Ebony Jewelwing damselfly and the fly in the following segment are eating very small insects. Skippers are tough to identify, and I am mostly sure this is a Zabulon Skipper. If you are a skipper expert, let me know if I am wrong and what kind of skipper this is. Finally, enjoy the fall-plumage Chestnut-sided Warbler feasting on a caterpillar. Sorry about the blatant advertising, but at the request of many Nature of Delaware blog readers, we would like to update you on upcoming programs occasionally. This is so that you can avoid hitting your head in frustration after reading a blog about a Delaware Nature Society program that you missed and might have enjoyed. 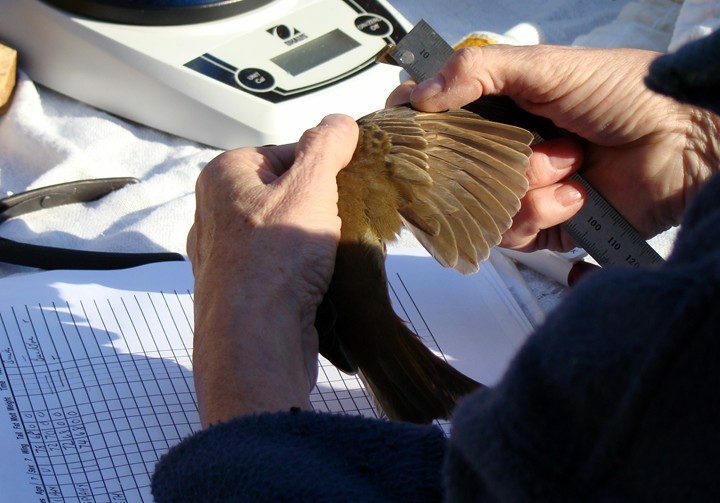 Two opportunities to participate in bird banding are coming up. 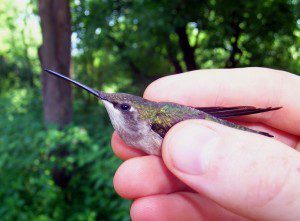 I know this is late notice, but there is still room in the Hummingbird Banding and Biology program taking place on Friday, August 21st, 9:30 a.m. to noon at Ashland Nature Center. Bruce Peterjohn, the Chief of the USGS Federal Bird Banding Lab will conduct a banding session and discuss the biology of the Ruby-throated Hummingbird. Catch hummingbirds, watch how they are banded and measured, and take part in the release. A Ruby-throated Hummingbird in hand. Female or juvenile? Photo by Derek Stoner. 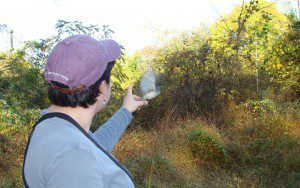 The other banding session is the Bird Banding at Bucktoe Creek Preserve with local bander, Doris McGovern on Saturday, August 29, 7:30 a.m. to 10:30 a.m. We conduct this program every autumn and catch migrants such as thrushes and warblers as well as common year-round residents. Both of these programs are will provide great opportunities to see wild birds in the hand and for close-up photography. 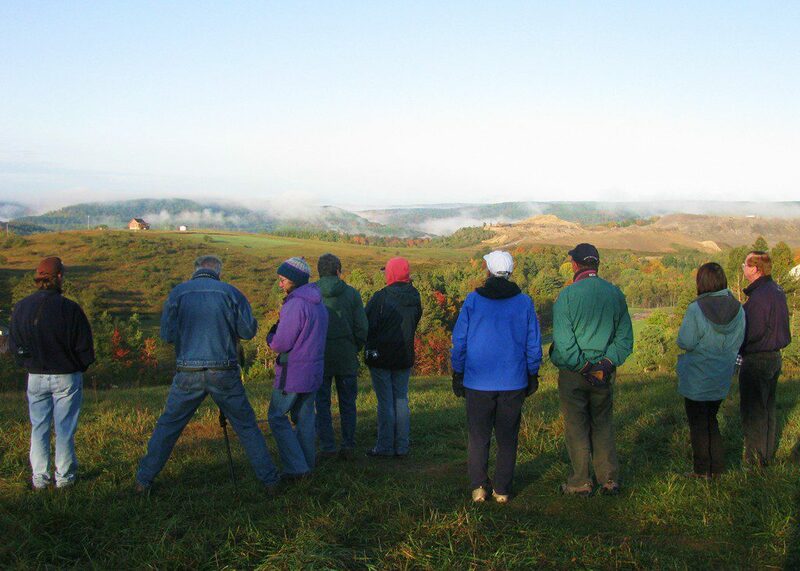 For more information on these programs, visit www.delawarenaturesociety.org or call (302) 239-2334 ext. 134. The past few evenings, cooling temperatures and a crisp breeze from the north caused my thoughts to jog ahead into fall. Somewhere on a mountain in northern Pennsylvania, herds of elk are grazing peacefully. 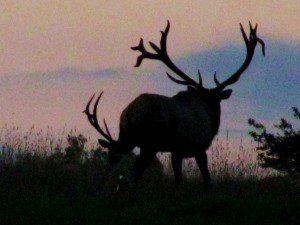 As dusk settles, a pair of huge bull elk bugle and battle atop legendary Winslow Hill. Come September, the peace will be shattered by the roar of bugling bull elk as their annual mating ritual begins. Massive bulls will clash antlers, smash trees, chase rivals, and bring chills to the spines of wildlife watchers. A cow elk and her calf join a herd grazing in a field near Benezette, PA. 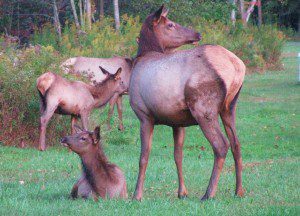 The wild elk herd in Pennsylvania numbers over 1,000 and is a credit to the dedicated efforts of conservationists. Every fall, thousands of visitors make a pilgrimage to places like Winslow Hill, Benezette, and Medix Run to breathe in the crisp fall air and listen to the music of bugling elk. 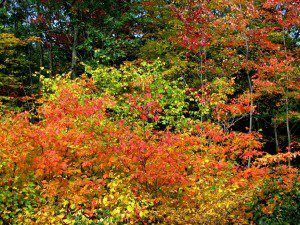 Maple and Sassafras trees ablaze with fall color in the Pennsylvania Wilds. A bounty of beautiful scenery, brightly-colored leaves, and a wide array of wildlife greet autumn visitors to the Pennsylvania Wilds, a 2-million acre swath of protected land. Outdoor opportunities abound, and late September is true fall in northern PA, with chilly nights and crsip, clear days. Watching herds of elk against a backdrop of fall color and mountain mist. view this spectacle first-hand. The Wilds await and we invite you to join us for the adventure. The elk await your arrival!